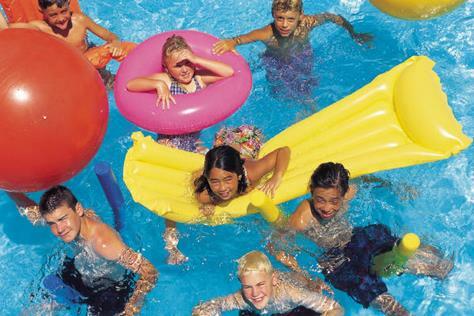 Summer pools are opening in Phoenix soon, which means the start of summer is almost upon us! Staying cool, having fun and doing it on the cheap can be tough in Phoenix, but it’s not impossible. There are a lot of fun ways for kids to have a great summer vacation in Phoenix, both indoors and out, while on a budget. Take a look at these 30 kid-friendly ideas for cheap summer fun in Phoenix, and share your tips in the comments. How do you stay cool in the Phoenix summer heat? Go swimming – Swimming in Phoenix is a summer pastime, and no kid’s summer vacation in Phoenix is complete without a least a dip in a pool. Luckily for Phoenix kids, city pools are incredibly cheap and a ton of fun. Pools like Cortez and Pecos even rival the expensive water parks Phoenix is famous for, with splash pads and slides, at a mere fraction of the cost. Kids swim for $1, adults $3 and seniors $1. Visit a Gila Monster – At Playtopia in Chandler, kids can play for free at one of three different “lands”: Farm Land, City Land, and Critter Land, where kids can play on a massive gila monster. Playtopia has ramadas, picnic tables, and plenty of shade to escape the heat. Go early for the coolest weather and then cool off under the shade. Visit Tempe Town Lake – While you can’t swim in Tempe Town Lake, there are plenty of other fun, cheap things to do on and near the lake. Bring your bikes to bike Tempe Beach Park, take an early morning walk around the lake, or indulge kids’ (and adults’) quest to acquire more Pokemon with Pokemon Go around the Lake. Visit the City of Tempe website for more information. Visit a skate park – Almost every Phoenix neighborhood has a skate park, like Desert West Skateboard Plaza in Phoenix, free to use. Find the one closest to you here. Sign up for summertime reading challenges – visit a Phoenix public library and sign up for the summer reading program. People of all ages, including “pre-readers” and adults, can sign up for a reading program, and as kids complete reading milestones, they’re entered to win some delicious and fun prizes. Adults are rewarded with a giveaway as well. For more information, visit the City of Phoenix summer reading program page. Check out the Cardinals in action – The Cards have open practices at the University of Phoenix stadium leading up to the regular season. For training camp dates, visit the Cardinals page here. Go out early to the Botanical Gardens – the Desert Botanical Garden in Phoenix is one of the most beautiful places to visit year round. Beat the heat and go early to the Desert Botanical Garden for free on the second Tuesday of each month from 7 am to 8 pm (summer hours). Visit the Phoenix Zoo at a discount – Did you know the Phoenix Zoo offers discounts for students and AAA members? Those discounts, and more, can be found here. Summer hours for the Phoenix Zoo are 7 am to 2 pm daily. Picnic at Encanto Park – Encanto Park is a 222-acre park with so much more than picnic areas. Encanto Park has a lagoon, nature trail, urban fishing and more, so you’ll find plenty to do before and after your picnic by the lake. Celebrate the 4th of July at Schnepf Farms – one of the Valley’s best-loved farms, Schnepf Farms is hosting a 4th of July event with gates opening at 4 pm on July 4th. Admission is $20 per car, and there will be fireworks (of course), mini golf, petting zoo and more. Summer movies in the park – Peoria – slightly outside of Phoenix, drive over to Peoria for a free summer movie in the park. June 3 from 6 to 9 p.m. The first 25 people will receive free goodie bags, click here for address and more information. Summer movie fun inside – Want to see movies like Trolls, Pets, Rock Dog and more for less than a dollar per movie? Check out Harkins’ summer movie series starting May 29. See them all or just catch a few, all indoors under the air conditioning. For more information and locations, click here. Teen book clubs – teens need fun, cool (as in A/C) and free activities too, and they’ll get that and more at the Changing Hands bookstore. Tweens and teens have their own book clubs, and teens can be a part of the Teen Advisory Board, giving their input on books and more. Click here for more information. Do your kids love art? Sign them up for Michael’s Camp Creativity from June 12 to July 28. Classes are $5 per session or $12 for three sessions. For more information and to sign up, click here. City Lights Movie Nights at CityScape – beginning June 9, every second Friday, CityScape transforms into an outdoor movie theater in Patriots Park downtown Phoenix. The event is free and family-friendly. Click here for more information. Pottery and canvas painting – As You Wish Pottery Painting Place has a summer program for kids beginning June 5 through July 21 where kids can paint on pottery and canvas to create masterpieces for the home. Each class is $25. For more information and dates, click here. Little Howlers Hockey – is your child interested in hockey, but you’re not sure if you should spend a lot of money on gear and hockey camps? Check out Little Howlers Hockey, an on-ice youth hockey program in cooperation with the Arizona Coyotes. The program is four, one-hour sessions designed to provide kids ages 4-8 an introduction to the sport of hockey. Each child will receive a free set of One Goal rental equipment to be used during the four-week clinic, and a free pair of rental skates provided by the rink. For more information and to sign up, click here. Fun crafts at IKEA – IKEA is more than a home store and delicious cafeteria – it also offers free crafting events for children. Every first Saturday and third Sunday of the month, visit IKEA for free crafts for children. Click here for more information. Take a farm tour at Superstition Farm – another famous farm just outside of Phoenix, Superstition Farm offers farm tours Tuesday through Saturday, $9 for adults and $7.50 for children. On the farm tour, you’ll visit Moo-University, take a hayride, visit some farm animals, and taste test at the Milk Bar. For more information, click here. Get building at Home Depot – Home Depot offers a variety of classes for kids to take, including a make-your-own wooden tic-tac-toe game and more. If you’re looking for ways to teach your children to be handy, Home Depot’s kids classes are a great way to start out. For more information, including dates and registration information, click here. Visit the Stuffington Bear Factory – want to see how teddy bears are made? Visit the Stuffington Bear Factory for a free mini-tour, offered Monday through Saturday at 1 p.m.
Free bowling – one way to get some exercise and stay indoors is bowling, and kids bowl free at Let It Roll Bowl in Phoenix all summer long with this promotion. For more information and to sign up, click here. Jam out at the Musical Instrument Museum – one of Phoenix’s most beautiful and interactive museums, the MIM offers family workshops throughout the summer. Bring the whole family to the Family Drumming Workshop on June 18. The workshop lasts one hour and costs $12 per person. For more information and times, click here. Free family weekends at the Phoenix Art Museum – this summer, inspire your kids by taking them to the Phoenix Art Museum for free. For more information, including times and exhibits, click here. Westgate Wednesdays free summer series – has your kid been wanting to meet his/her favorite superhero or princess? Take them over to Westgate in Glendale beginning June 7 to meet their favorite character, get a free photo, and play in the splash pad before and after the event. For more information and character days, click here. Dads and Granddads get in free at the Phoenix Children’s Museum – to celebrate Father’s Day, the Phoenix Children’s Museum is free for dads and granddads on June 18 from 9 a.m. to 4 p.m. For more information, click here. Free summer Sundays at the Heard – visit the Heard Museum in downtown Phoenix for free on Sundays this summer. Check out free performances, artist demonstrations and more. Click here for more information. Take them out to the ball game – The Arizona Diamondbacks’ schedule is in full swing during the summer, which means plenty of opportunities to take your kids to the matinee prices of baseball games, or go for the theme days, like Star Wars Day or Baxter’s Birthday. For more information and ticket prices, click here. Creative Saturdays and Family Days at the Arizona State University Art Museum – visit the ASU Art Museum to make art for free with Museum Ambassadors. July 8 is Family Day, which means the whole family can make, learn, and play with art at various stations set up at the museum. For more information, click here. While it might not be great for your washing machine, Mighty Mud Mania in Scottsdale is a great, free way for kids to get a ton of exercise and have fun. The event is held June 10 from 7:30 a.m. to 1 p.m. and is completely free for kids under age 18. For more information and location, click here. Any free or cheap activities for kids that we missed? Let us know in the comments, and we’ll include it in the next round up!